An integrated software system from CODY is more than just software. It is the fusion of software, implementation and project management services, and 24x7 total support and maintenance delivered the old-fashioned way... by a real, live person - not a digital menu system or voicemail box. We are proud to maintain a 98% client retention record. 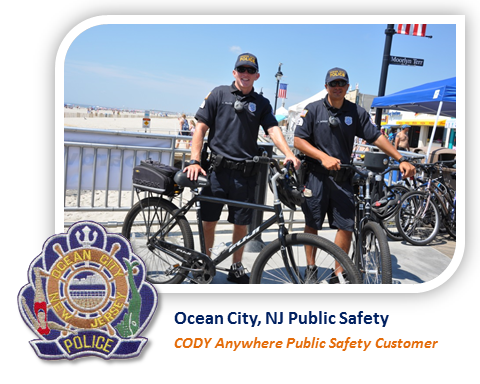 CODY's "Anywhere" line of public safety software puts the power of enterprise public safety software in the hands of users wherever and whenever they need it. Highly configurable, adaptable and scalable to meet the varied needs of enforcement agencies of all sizes, scope and missions, CODY Anywhere provides the right information, to the right people at the right times to inform, protect, and manage an enforcement agency's resources. CODY's COBRA.net real-time data sharing system is tailor-made for law enforcement. The system provides real-time cross-jurisdictional data sharing and exchange for police departments and all other law enforcement, public safety and criminal justice agencies. Most importantly, it is completely vendor neutral (RMS, CAD, etc. ), field-proven across hundreds of agency-deployments, working with disparate data systems, regardless of vendor or database engine. Our software is powered by technologies researched and developed by CODY. Innovations such as "Anywhere" Access, CODY True Integration, CODYLinks Relational Awareness and others create the core foundation for all of our products. Due to extensive configuration and tailoring options, CODY solutions serve diverse agency types and missions, including municipal law enforcement, PSAPs, Campus Safety, State Regulatory Agencies, Natural Resource and Fish/Wildlife Enforcement, Alcohol and Drug Enforcement, Benefits Fraud Investigative Units, K-12 Security, Tribal Law Enforcement, Federal agency facility security, State-wide, regional and county-wide Information Sharing Consortiums, and many more. Software is only part of CODY's overall solution. To complement and ensure our customers are given every opportunity to realize the full extent of their CODY investment, we provide fully integrated, comprehensive software deployment and implementation services, including a dedicated software implementation (Project) Manager.